Opening day for the Cubs is considered a holiday for many Chicagoans on a normal year, but 2017 marks an especially momentous occasion: the opening game after last year's World Series win. If you don't have tickets to the home opener but still want to celebrate, we rounded up a bunch of specials happening around town. And if it's not already on your calendar, mark Monday, April 10 at 7:05pm for when the Cubs take on the Dodgers at Wrigley Field. AliveOne: From 3–5pm, cash in on happy hour specials like half off all drinks and $3 Old Style beers. If you're looking for something slightly more high-brow, grab a $4 Half Acre beer and enjoy free pool. Bar Lupo: Looking for a quirky home opener special? Bar Lupo is pairing its regular Monday special (half-priced wine) with free meatballs with your first drink at the bar and a special bolognese chili dog topped with house-made giardiniera. Commonwealth Tavern: Snacks and local beer are the name of the game at Commonwealth Tavern. Enjoy $5 Chicago craft beers and $5 soft pretzels while you watch the game on eight TVs. Dark Horse Tap & Grille: Head to Dark Horse early to pregame the main event (the bar will open at noon) with specials like a $14 double header burger, a black angus patty topped with a hot dog from Paulina Meat Market with applewood smoked bacon and cheddar cheese. Wash it all down with $4 Old Style tallboys and $6 Crown Royal apple whiskey pours. Plus, enter the bar's raffle for a chance to win a pair of tickets to a future Cubs game. Estelle's: Grab half-price burgers, $4 Fernet-Branca shots and $3.50 draft beers at this Wicker Park hotspot, which is just far enough from Wrigleyville to avoid the craziness of the actual game. Game Room at Chicago Athletic Association: Play games and watch the Cubs at the same time at Game Room. The expansive bar will offer a Heffelfinger hot dog (avocado, lime, pickled onion and sport pepper relish) paired with caramel corn and a beer for $10. Hey, if you can't get your Cracker Jacks and ballpark dog at the field, this deal should do the trick. Jerry's Sandwiches: Head to the Lincoln Square and Andersonville locations of Jerry's Sandwiches for a Chicago beef sandwich ($13) with pot roast, mozzarella and giardiniera. Dodgers fans can nosh on Jerry's California Veggie Delight ($12.50) with fried tofu, avocado, asparagus and cheddar. Both restaurants will be showing the game on two screens a piece. The Lincoln Square location will be open 11am–midnight, and the Andersonville location will be open 11:30am–midnight. Old Town Social: With 24 big screens and $2 Old Style, Old Town Social is the place to watch the game. Additional specials include $5 Schwar-bombs (Ketel O Bombs) and $10 Chicago-style hot dogs. 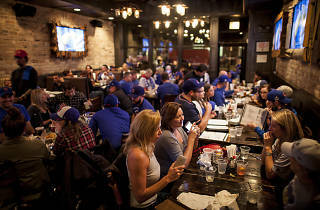 Rockit Burger Bar: Situated so close to Wrigley, Rockit Burger Bar is a popular place to watch Cubs games. For the home opener, they'll be offering a mix of domestic and craft draft beers for $5–$9. Regular menu items will also be available. Sheffield's: Celebrate opening day with Sheffield's and Goose Island as they break out some vintage bottles (yes, craft beer fans, they will have Bourbon County varieties dating back to 2013, as well as rare bottles like 2008 Pere Jacques). Munch on indulgent dishes like beer cheese mac and cheese and a pulled pork sandwich made with Bourbon County Stout barbecue sauce. 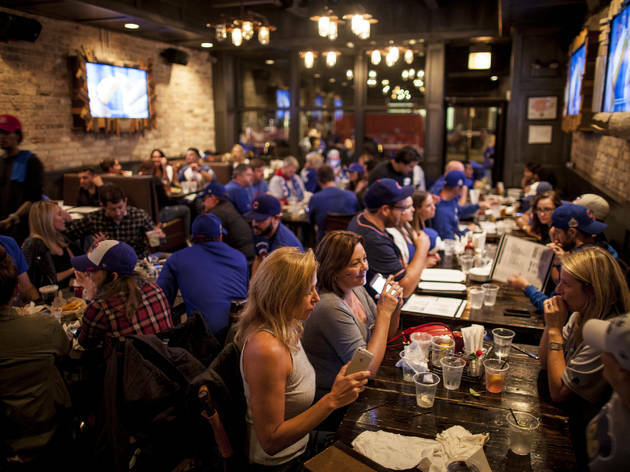 Timothy O'Toole's: The bar will be showing the game on 74 screens (yep, 74) and will have specials like Chicago Dog Fries (exactly what you think they are) and Chicago-style hot dogs. Choose from drinks like $4 canned craft beer and $14 Miller/Coors pitchers. Trader Todd's: To celebrate the home opener, Trader Todd's is throwing a beach party. Enjoy festivities like a steel drum player, Cubs-themed menu items and an attempt to break the record for Chicago's largest Facebook Live "Go Cubs Go" karaoke session at 6:05pm to kick the whole thing off.